Every month the TBR pile grows and grows! 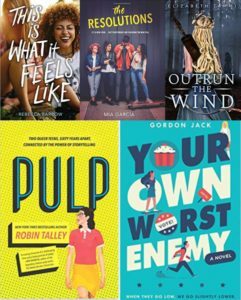 November releases included five intriguing new YA books that shouldn’t be missed. Music, fractured friendships and trying to figure out the next step after high school? Sounds like perfect YA. 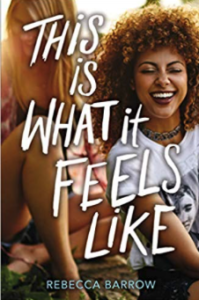 Summary from HarperTeen: It used to be the three of them, Dia, Jules, and Hanna, messing around and making music and planning for the future. But that was then, and this is now. And now means a baby, a failed relationship, a stint in rehab, all kinds of off beats that have interrupted the rhythm of their friendship. Check out Rebecca Barrow’s website. Two queer teens, sixty years apart, connected by the power of storytelling. Yes! 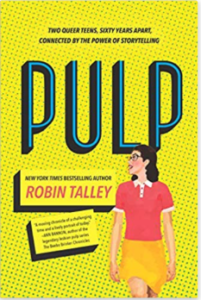 For extra fun, author Robin Talley has hidden lesbian pulp fiction Easter eggs throughout the book. Grab your basket and let’s go! Summary from Harlequin Teen (HarperCollins): In 1955, eighteen-year-old Janet Jones keeps the love she shares with her best friend Marie a secret. It’s not easy being gay in Washington, DC, in the age of McCarthyism, but when she discovers a series of books about women falling in love with other women, it awakens something in Janet. As she juggles a romance she must keep hidden and a newfound ambition to write and publish her own story, she risks exposing herself—and Marie—to a danger all too real. First Draft podcast recently released a fantastic interview with Robin. Listen on iTunes or on the First Draft website. Learn more about Robin Talley at her website. Anyone who can write and publish a book while still in college is astounding. I’m doubly impressed that this debut novel is a new take on Greek mythology featuring Artemis and her huntresses. Well done! Summary from North Star Editions: The Huntresses of Artemis must obey two rules: never disobey the goddess, and never fall in love. 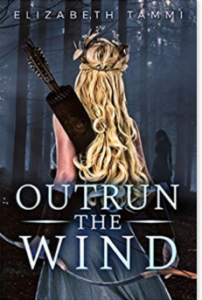 After being rescued from a harrowing life as an Oracle of Delphi, Kahina is glad to be a part of the Hunt; living among a group of female warriors gives her a chance to reclaim her strength. But when a routine mission goes awry, Kahina breaks the first rule in order to save the legendary huntress Atalanta. As her connection to Atalanta deepens, Kahina finds herself in danger of breaking Artemis’s second rule. She helps Atalanta devise a dangerous game to avoid marriage, and word spreads throughout Greece, attracting suitors to go up against Atalanta in a race for her hand. But when the men responsible for both the girls’ dark pasts arrive, the game turns deadly. Learn more about debut author Elizabeth Tammi at her website. This book sounds so fun. And potentially shattering! Four Latinx teens make New Year’s resolutions for one another. Cannot wait! Summary from Katherine Tegen Books (HarperCollins): Jess, Lee, Ryan, and Nora have always been inseparable. But now with senior year on the horizon, they’ve been growing apart. And so, as always, Jess makes a plan. 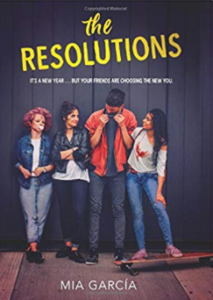 Reinstating their tradition of making resolutions together on New Year’s Eve, Jess adds a new twist: instead of making their own resolutions, the four friends assign them to one another—dares like kiss someone you know is wrong for you, find your calling outside your mom’s Puerto Rican restaurant, finally learn Spanish, and say yes to everything. 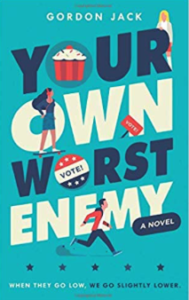 Are we ready for a satirical novel that takes on the electoral process and the popular vote in high school? Um, yep! Stacey Wynn was the clear front-runner for Lincoln High student council president. Until French-Canadian transfer student Julia Romero entered the race…and put the moves on Stacey’s best friend/campaign adviser, Brian. Stacey also didn’t count on Tony Guo, resident stoner, whose sole focus is on removing the school’s ban of his favorite chocolate milk, becoming the voice of the little guy, thanks to a freshman political “mastermind” with a blue Mohawk. Three candidates, three platforms, and a whirlwind of social media, gaffes, high school drama, and protests make for a ridiculously hilarious political circus that just may hold some poignant truth somewhere in the mix. Each year, eight beautiful girls are chosen as Paper Girls to serve the king. It’s the highest honor they could hope for…and the most demeaning. This year, there’s a ninth. And instead of paper, she’s made of fire. This sequel to Forest of a Thousand Lanterns is a fairy tale retelling lives in a mystical world inspired by the Far East, where the Dragon Lord and the Serpent God battle for control of the earthly realm.